I smile when I have been working on a blog for a while in my head and then my pastor delivers a sermon that completes my thought. It happens more often than you would think. I am currently studying the book of James with a group of women from our church. If you know anything about James, it is a book that tells it like it is. When you get done studying James, you have no excuse for not having faith and trusting God in every situation. That being said, I have been thinking about my faith lately and questioning how I can grow and believe with an unstoppable faith. When I spoke at a retreat recently, I asked a question to the audience. I said, “If you truly believed God was always going to do something good through your suffering, would you finally be able to say, ‘Lord, here I am, use me.’” I don’t know about anyone attending, but personally, that question has been ringing in my head ever since. I often wonder how many times I have missed out on a blessing because I have not had the faith to believe God would get me through the situation He was asking me to endure. 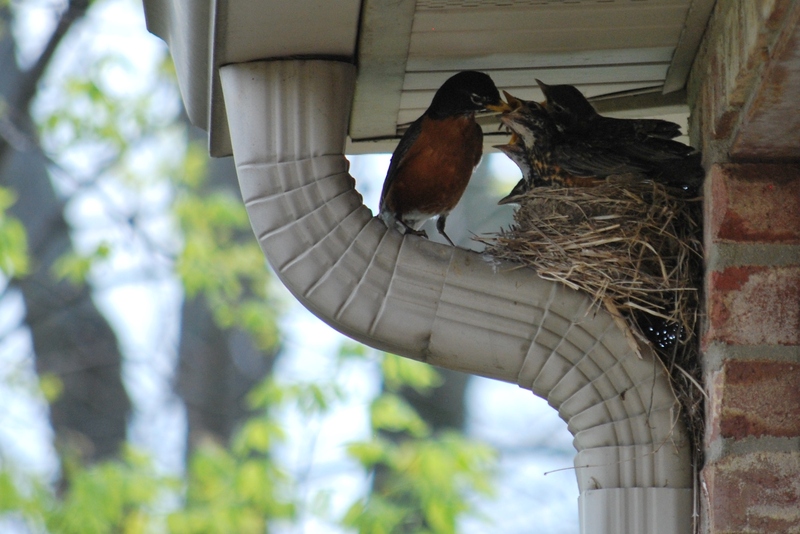 This summer we have had a robin’s nest right outside the kitchen window. 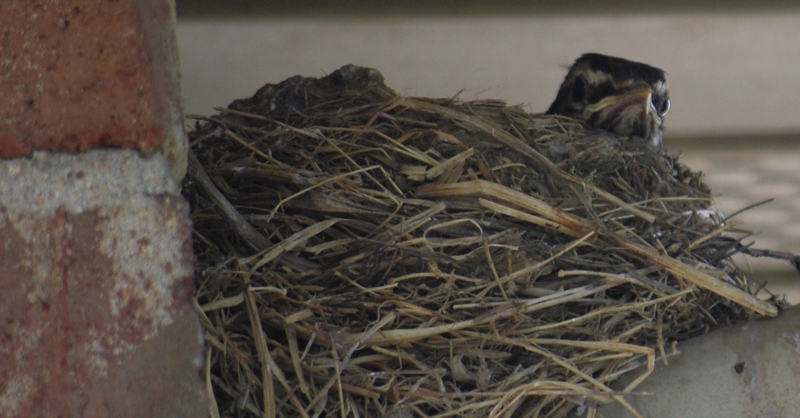 I think it is the same bird that has laid two sets of eggs. 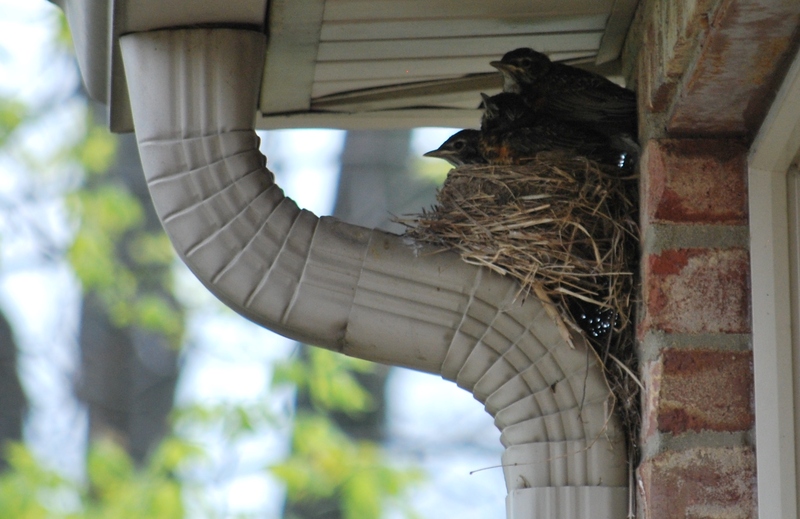 We watched the first three grow up until they were literally hanging over the edges. Since then, we have enjoyed watching them learn to fly and explore their new world to the point of total exhaustion where they can’t move if they tried. This last group of babies has been different from the first ones, though. There were three to begin with and now there is one. 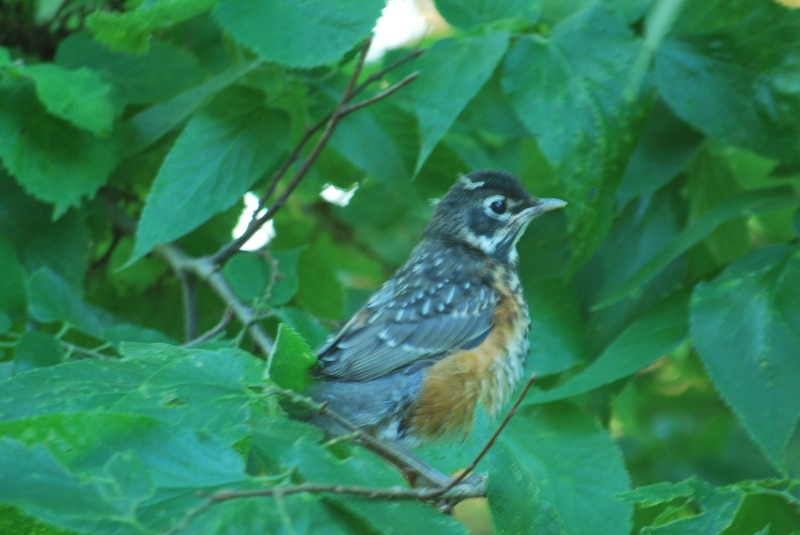 I think that two of the three are already out of the nest because I am seeing them around the yard. For some reason, this one particular bird is still there. My imagination runs wild wondering why. Is it just a lazy bird and as long as mom and dad bring the worms, it’s decided this is the life? Maybe it has a disability that I can’t see…a broken wing or something that prevents it from leaving. Perhaps it lives in fear of a world outside its nest and is frozen with anxiety, unable to make a leap. Whatever the reason, the parents continue to nourish it and watch after it with high hopes of it flying on its own someday. Since the retreat, I have been thinking, “What is it that God wants me to do that I haven’t already done?” Is He speaking to me and I am not hearing or has He simply not called me yet to my next adventure? Did you ever feel like there is something else you should be doing but you can’t put a finger on what it is? Perhaps you think you know what it is but you have no idea how to get there or make it happen? Is it fear or circumstances holding you back? Do you have faith enough to trust God to show the way? Just like the baby bird’s parents; God will continue to watch over us while we muster the courage to trust and follow His lead. However, we are all going to look pretty silly sitting in a nest that is too small for us waiting for the next worm to arrive when we could be doing it ourselves. For when we take that leap of faith and look to the sky, we will find ourselves flying to heights only the heavens have seen. 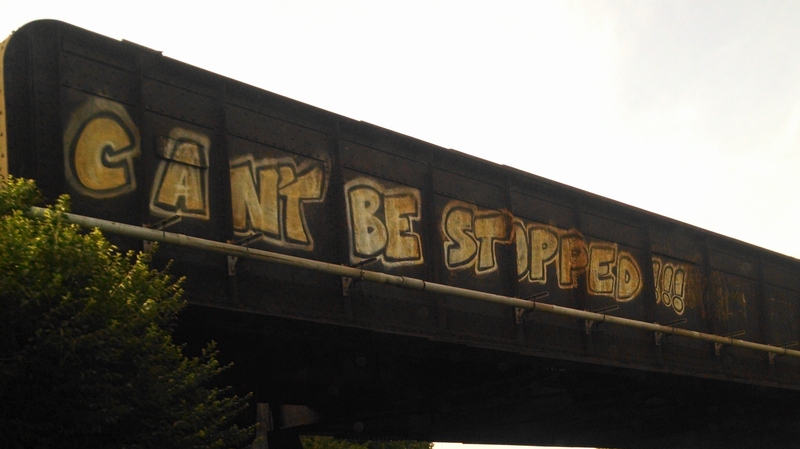 There is some graffiti on an overpass on my way to work that I see daily that says, “Can’t be stopped.” I know the artist probably didn’t mean it for this purpose, but God speaks to me through that message every time I drive past. I find myself praying, Lord, give me the courage to believe with a faith that is unshakable to know You have got my back. Help my unbelief and allow me to soar through life with You as my guide. Give me the courage to do the things You’re calling me to do without fear. Give me a “can’t be stopped attitude” for Your work I need to do here on this earth! Is God speaking to you? What are your fears? 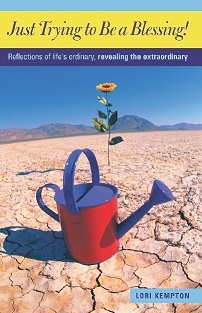 What are your hindrances? May He give You direction and purpose with a faith like Jesus in the days ahead. Jesus was willing to do whatever He needed to do to save us from our sins. He had the kind of faith that never doubted His Father’s promise that He would someday be reunited in heaven with His Father. He didn’t allow his circumstances to discourage Him. I want that kind of faith…don’t you? So what are we waiting for? Let’s fly! Previous Whose Job Is It, Anyway? Next Trust The One Who Wants to Rescue You! Lori, this is so beautiful, I’m so glad I read it tonight. For some reason, I could not fall asleep, not that I felt restless or uneasy, but something kept me from sleeping. Now I know. I needed to read your message, I needed it today. 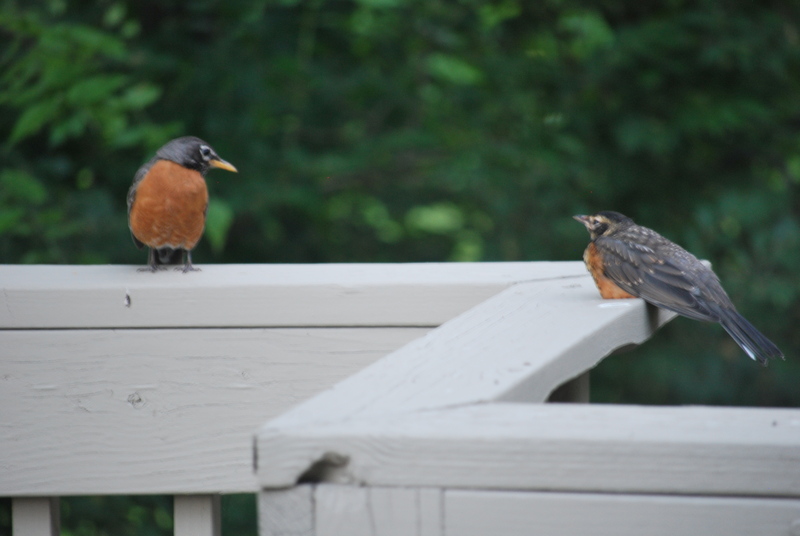 I did not realize that that “lingering” little Robin and I maybe have something in common. Do I hang on to things that feel comfortable, am I afraid to go to he edge of the nest and trust and believe enough that I can take that “flight”? Is my faith and trust strong enough to know God will be always by my side ? 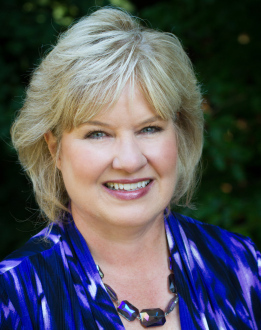 I to must say: ” Lord I believe – help my unbelief ” Thank you Lori for your wonderful writing, it has truly blessed me and I have a peace right now, a peace that can only come from God. I’m so glad God could use my story to minister to you, Elisabeth. It makes it worth the time I spend writing. Have a blessed week…and sweet dreams, my friend! This was your best spiritual story yet using a God’s little birds to teach a lesson with humor. Thanks, Kathy! God comes up with the material… I just pass it along! Thanks for reading and commenting. Have a blessed week!